Search Results for "first aid kit"
1960s: Puppet man sits reading First-Aid brochure. Puppet man wearing arm cast, standing next to rocking chair. First-aid kit brochure. First-Aid kit. Puppet man sits reading First-Aid brochure. 1960s: Puppet man falls down stairs. Brochure for first-aid. First-aid kit. Puppet man approaches door with First-Aid Class sign on it. First Aid Kit. Medical kit concept with hand holding medicine chest with cross and healthcare icons. Available in 4K video 2D render footage on white. Animation logo icon for yours presentation. Speed 3. Camera pans a top view of tablet quickly. Rotating circular drug. Many colored pills. 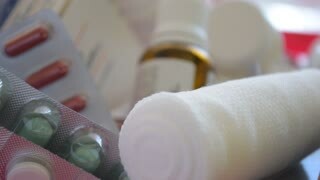 Stand footage of medicine. Blister with colorful capsules. Dizzy frame. Most first aid kit. Aid kit 4k. Speed 3. Camera pans a top view of tablet quickly 4k. . Rotating circular drug. Many colored pills. 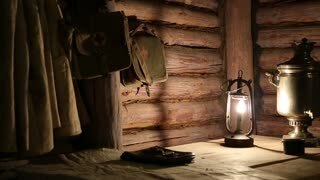 Stand footage of medicine. Blister with colorful capsules. Dizzy frame. 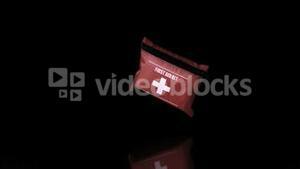 Most first aid kit. Aid kit. Panning colored blisters top view. To be healthy. The man fell ill. The slow movement of the camera on the slider. Close-up of a heap of tablets. Colorful pills. first aid kit and a pharmacy. A huge number of pills falling on white background top view. Multi-colored tablets are flying in the air. A first aid kit. Beautiful drop pills on the table POV. Medicine chest. 1950s: Woman walks up to injured man sitting next to car, sets down first aid kit. Woman looks at unconscious woman and injured man. 1955 - The living quarters in a civil defense family fallout shelter has bunkbeds, tools, an emergency first aid kit and a signal light in Maryland. 1950s: Items placed in first-aid kit. People carry items to car and pack up car. A huge number of pills falling on white background top view in slow motion. Multi-colored tablets are flying slowly in the air. A first aid kit. Beautiful drop pills on the table POV. Medicine chest. 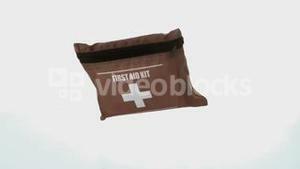 Slider shot of a bandage leading to a first aid kit. Nurse put a white first-aid kit on the table during an epidemic. Women's hands take white rubber medical gloves. Doctor with a bag or box with a cross. First-aid kit mounted to a purple wall in an office setting.